Today brought much news, hardly any of it good. The Iraq Study Group finally got around to pointing out that the war isn’t going well, but we’re still probably going to stay there. Taco Bell blamed the lowly scallion for making people sick. Christmas shoppers apparently aren’t buying as much as they need to for the economy to stay afloat. And need I say it? Jennifer Aniston is once again alone. But–life can’t be all bad when it’s the first Wednesday of the month. 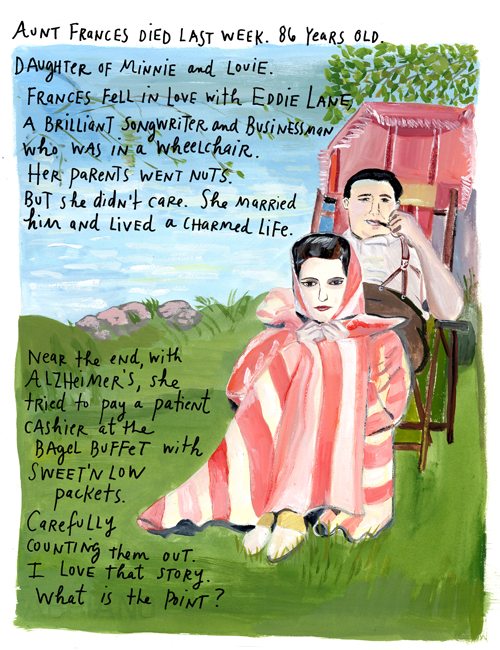 That’s the day that Maira Kalman‘s blog appears in the New York Times. Her blogs are so colorful and inspiring that they can only appear once a month; they take that long to accomplish. Even here there is a little bad news, I’m afraid: you pretty much have to subscribe to the New York Times to see them. But I have copied this one page from this month’s entry. Believe me, there are many more pages–and I hope you can somehow go on the site and read them all. They are so beautiful and moving that it’s almost worth the subscription fee.